At Bohemian Traders we care about providing on-trend fashion essentials for the everyday bohemian woman. This means offering all of our styles in a size-inclusive range, from 6 to 22 (2XS to 4XL). We know that when shopping online, it can be tricky to settle on the style and size that is right for you. Please know that you can always get in touch with us for further assistance. Our team all have first-hand experience with our garments and would be more than happy to talk through the fit, feel and styling recommendations of any garment. There is a size and style for every body type and we would love to help you find it! The easiest avenues for assistance would be to either email our customer service team at customerservice@bohemiantraders.com, or give us a call on +61 2 4327 8640 (Mon-Fri 9am - 5pm AEDT). 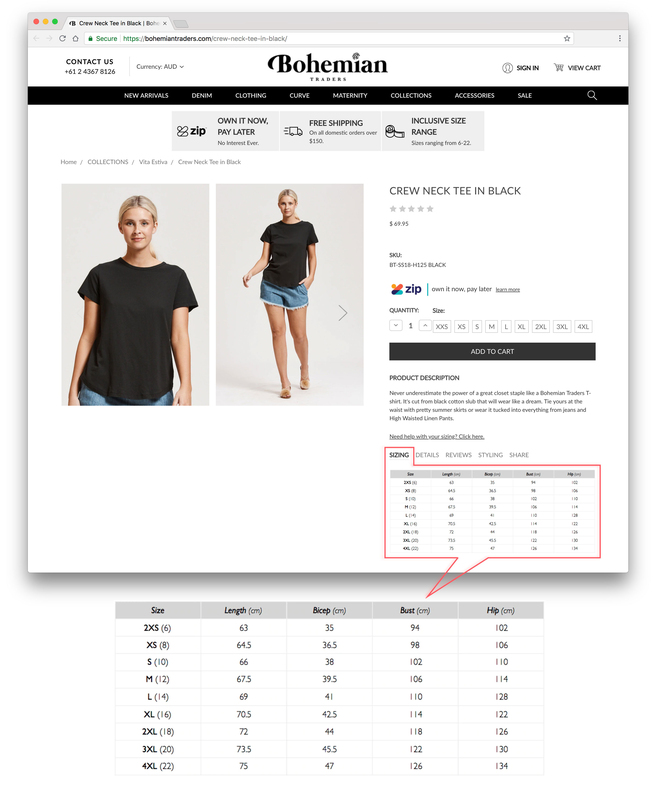 On the web listing for each of our garments, there is a size guide that has been created specifically for that item. We take great care ensuring that the charts are accurate - serving you as an essential tool in selecting the correct product. All of our garments are measured in centimetres, and are of the garment laid flat. For measurements that go around the body (eg. bust, hip and waist) the measurement across the garment is doubled (to account for front and back). The following diagram and info indicates exactly where on the garment the measurements are taken. In order to find the best size for you, measure the corresponding part of your body or compare to garments that you already own. 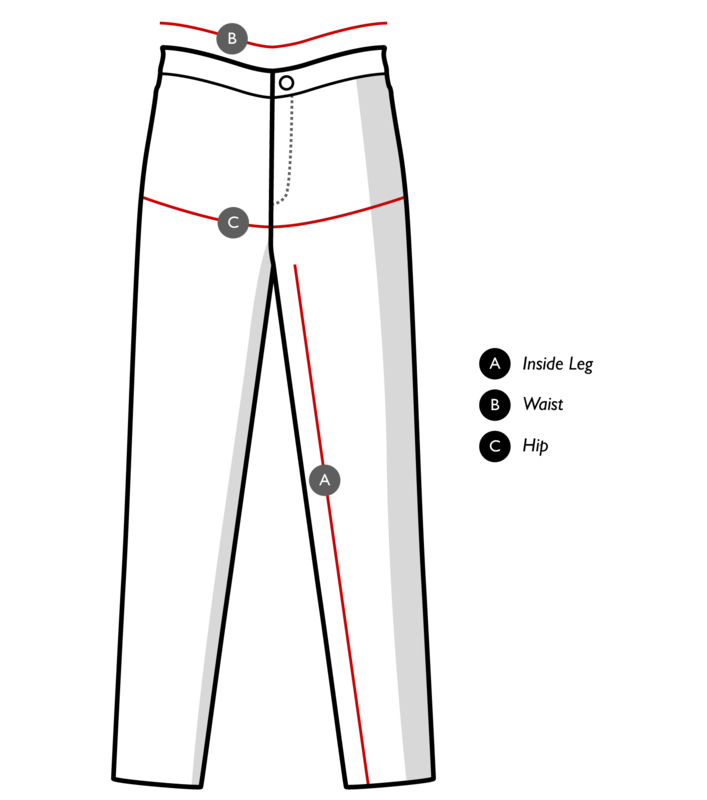 (A) LENGTH is measured from the highest point on the neck seam straight down to the bottom hemline. 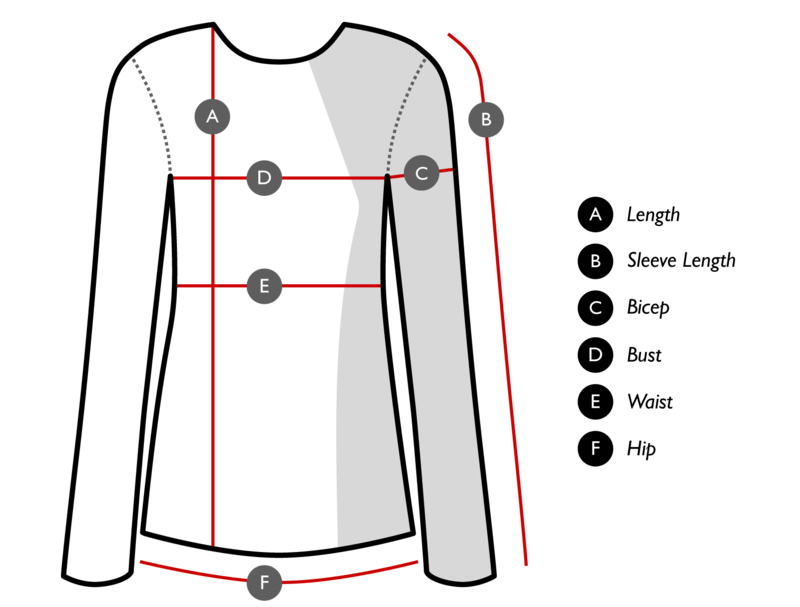 (B) SLEEVE LENGTH is measured from the highest point on the shoulder seam along the outside edge to the cuff. (C) BICEP is measured from the underarm seam to the outside edge of the sleeve, perpendicular to the length of the sleeve, and doubled. (D) BUST is measured from one underarm seam to the other, and doubled. (E) WAIST is measured across the torso at the narrowest point, and doubled. (F) HIP is measured along the edge of the bottom opening of the top, and doubled. (A) INSIDE LEG is measured from the crotch seam straight down the inside edge to the bottom of the leg. (B) WAIST is measured along the top opening of the item, and doubled. (C) HIP is generally measured across the fullest part of the bottom, and doubled. Note: hip measurement can differ with style, if in doubt please get in touch. Measure your body wearing the underwear that you would like to wear with the particular garment. Stand in front of a mirror and take note of the measuring tape's position around your body. When measuring around your body, such as bust, waist and hips, you want to ensure that it is as horizontal as possible. Ensure that the tape is always close against your body, but don't hold it too tight. The general rule is close but comfortable - not tight and not loose.